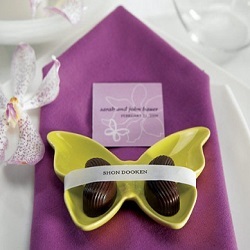 Butterfly wedding theme favors can add a bit of whimsy and fun to your special day. If there is anything more beautiful than a colorful butterfly floating through the air, it is a bride walking the aisle in a wedding gown plucked straight from her dreams. Butterflies can serve as your primary wedding theme, but they are also easy to incorporate with many other themes. 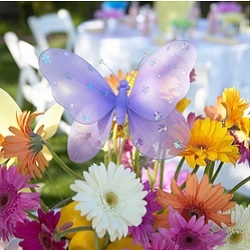 Butterfly wedding favors and decorations come in solid colors or multiple colors and a variety of designs, so you can find items that are perfect for your big day. If you are trying to conserve your budget by creating some of your own reception decorations, you can easily make strings of paper butterflies to hang from the ceiling or drape around the room, creating the appearance of butterflies floating through the air. If you are more concerned about saving time, you can purchase pre-made butterflies ready to dance at your reception. Butterfly wedding theme favors add elegance and warmth to your reception even if your overall theme doesn’t include butterflies. Here are five of the best butterfly favors available today. Heart to Heart Hanging Butterflies - You can purchase these colorful butterflies in different sizes, and they are designed to easily go wherever you want them. They are easy to hang from the ceiling or perch on a wall, and they have legs that allow them to stand on flat surfaces. Each butterfly is made by hand, so you may see slight variations between them. No two butterflies are exactly alike. 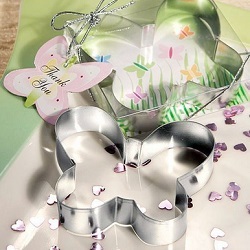 Butterfly Cookie Cutter Favors - Don’t waste your money on wedding favors that your guests will leave sitting on the tables when they leave. Cookie cutters are functional kitchen tools that your guests will want to take home, and these are shaped like butterflies to match your wedding theme. Each durable metal cookie cutter comes in its individual package, so you can easily set them on tables or leave them in decorative baskets for your guests to enjoy when the wedding is over. Butterfly Candy Dishes – Ceramic - Butterfly-shaped ceramic dishes can easily double as part of your wedding décor and favors that your guests can take home. While these dishes are designed to hold candy, you can fill them with rose petals, votive candles or anything that fits your wedding theme and fills a need in your décor. They are available in four different colors, including white, lavender, aqua blue and apple green. 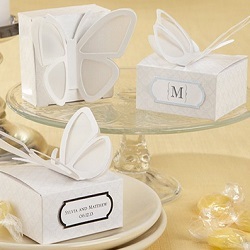 Personalized 3-D Butterfly Favor Boxes - When folded into shape, these favor boxes create 3-D butterflies standing on the top. They look beautiful when sitting at each seat in the reception room, and your guests will find them too pretty open. Tuck candy, candles or any other favors you want to hand out inside each box, and your guests will have a special surprise as they leave your wedding or wait for the bride and groom to arrive at the reception. This is a personalized wedding favor, so you can put your special touch on each box. 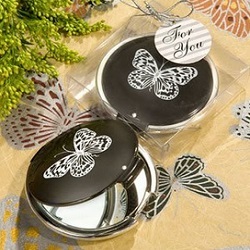 Compact Butterfly Wedding Favors - Every woman and little girl has a need for a compact mirror. These mirrors are designed in elegant black and silver, so they fit easily into any wedding color scheme. They are made from hard plastic and feature dual-sided mirrors. You can save them for special wedding guests or leave them on the reception table for every female guest in attendance.